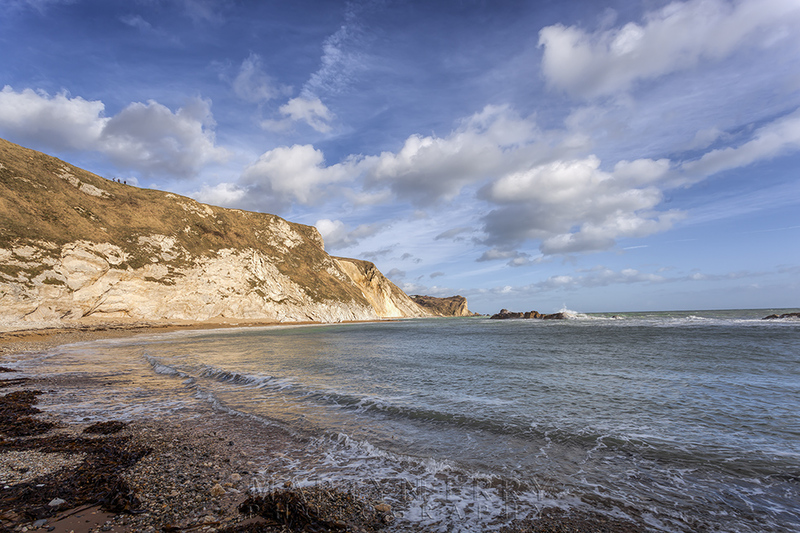 Recently I spent a few days in one of my favourite places, the Dorset coast. It had been a little while since I'd been there last, so I was keen to catch up with a few of the many picturesque spots this part of the country has to offer. I had arrived under an haze of evening drizzle, so there wasn't much I could get up to there and then, and a sunset was definitely not on the cards, so I pitched up to the accommodation and waited it out, hoping it would clear for sunrise the next day. It didn't. But thankfully, it didn't take long for the rain to clear and it soon turned into a a rather nice morning. 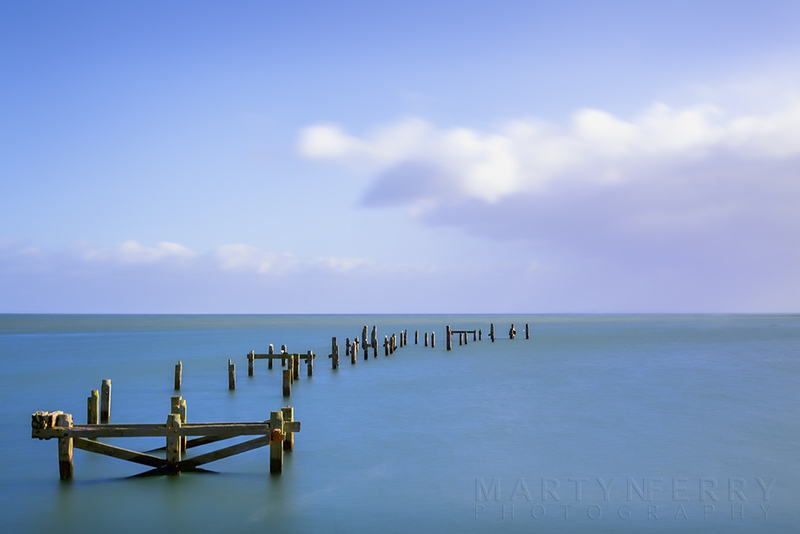 My first stop was to the old pier on Swanage seafront, I'd been there plenty of times before and probably got every shot there is to get of it, but I'd have felt remiss if I hadn't at least shown my face, it was only polite. Having taken plenty of pictures from this viewpoint, I took one more for good measure. I quite like the look of this simple image, with the vibrant blue, and the sunlight catching the yellowing wood of the pier, it reminds me of an Edward Hopper painting. Once I'd taken a few snaps of the old girl, I took a stroll around the headland to Peveril Point. 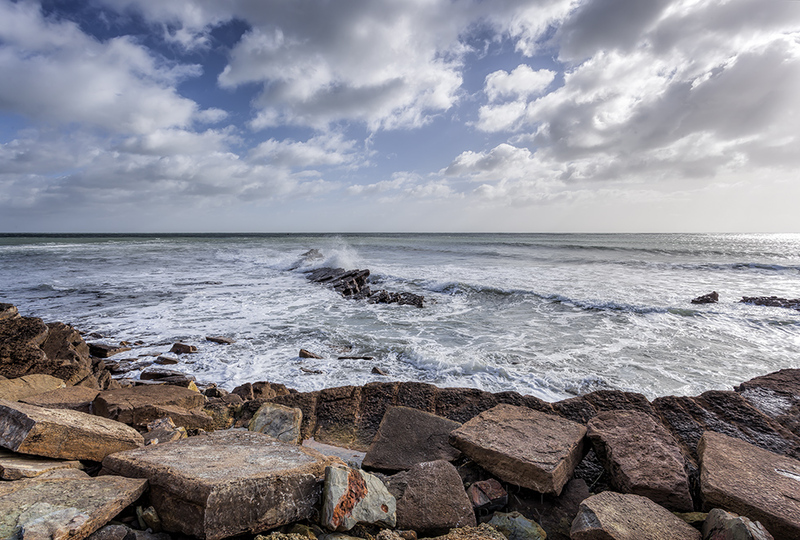 It was ferociously windy, and after I'd made my down to the rocky foreshore from the cliff edge, whilst trying not to be blown away by the gusts, I could see the waves were bashing away at the partially submerged rocks a treat. So I spent quite a bit of time, far too much time it has to be said, getting quite a few action packed shots, far too many action packed shots it also has to be said, of the crashing surf. With the foreground rocks and bustling ocean this picture is quite a contrast from the one of the pier above. 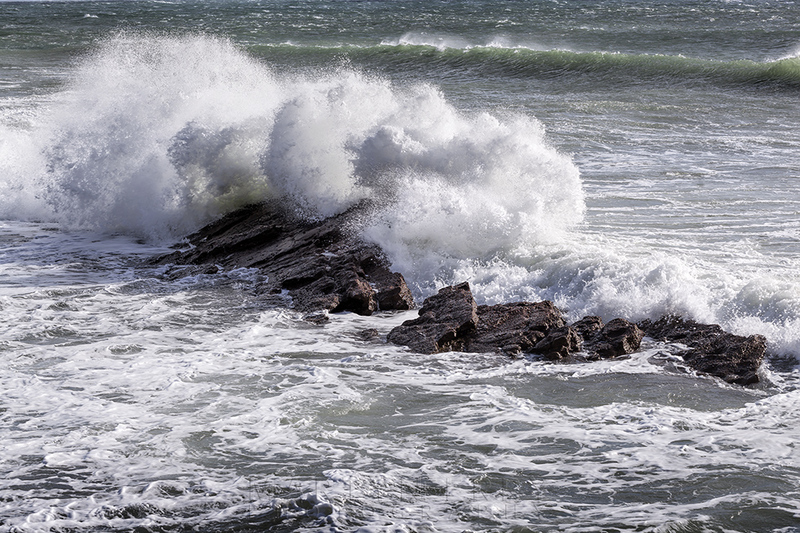 A close up of the rocks as they intercept the waves that are being harried over the ocean surface by the wind. 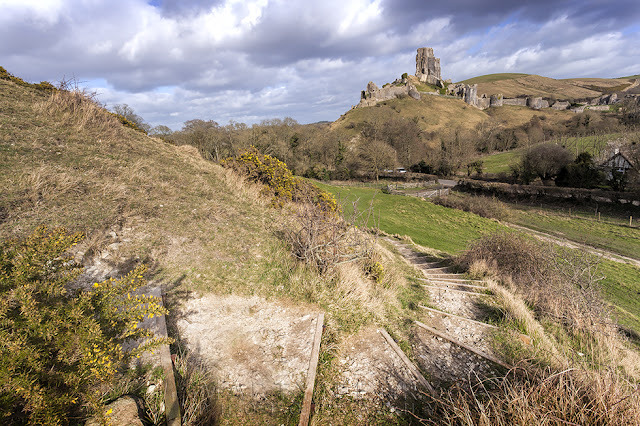 After I had come to the realisation that there is such a thing as too many pictures, a realisation that I would soon conveniently forget in the coming days, I headed back to town, availed myself of an excellent cup of coffee, jumped in the car and motored over to Corfe Castle. The sky was looking pretty decent by now, with a patchwork of blue appearing between thick, tumbling clouds, so I hiked part way up West Hill to get a view of the ruins and looked for a decent spot. Corfe Castle is another place I have been to many times, so it's difficult to find a new image, something I haven't taken before. 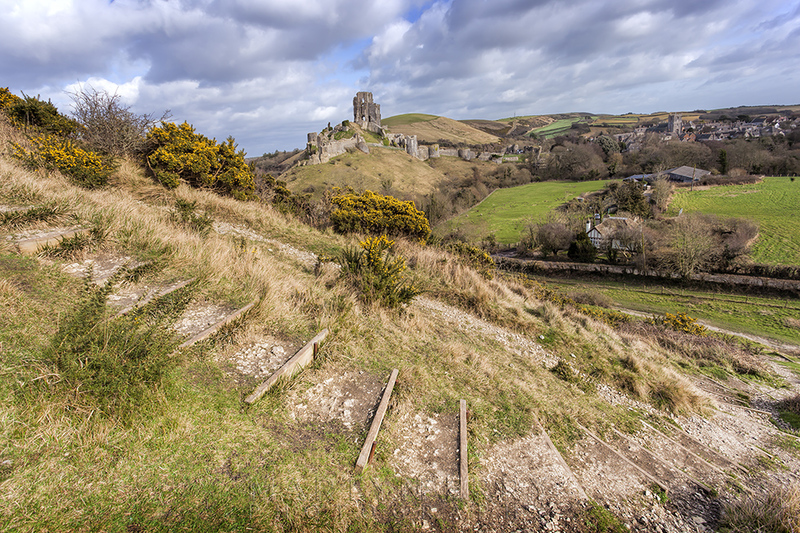 In this case I thought I would use the winding steps that that ascend the hill as a bit of foreground interest and see what I could do with them. Thankfully it worked out quite well, it took a bit of toing and froing, trying to find the best place to set up the tripod, so I could get the curve of the steps in the frame, along with the ruins, the village below and some of those amply proportioned clouds. Plus I became far to intimately acquainted with several thorny gorse bushes in my agitated efforts for my liking, but I was quite pleased with the results in the end. It's nice to find a new viewpoint to a familiar place. It was trickier than it looks to try and get all the elements in the image, there is still a bare patch on the bottom left, but there is only so much I can do, so don't judge me. Once I had exhausted all my options on the hill, I stopped in the village of Corfe itself to visit the Dragons Village Bakery, as I was about to treat myself to what I consider the finest Cornish pasties that man hath ever created. I'd had one on a previous visit and had often thought about it with much fondness since, such was it's exquisiteness, so I was looking forward to my second experience, and let me tell you, it did not disappoint. It was just as good as I remembered, so as I sat munching away, on one of the stone benches that can be found about the village square, under the warm afternoon sunshine, I could not have been happier. If you're wondering why it has the rather exotic name of Dragons Bakery, it's because the proprietor's name is one Mr Nigel Dragon. To be more precise, it is in fact Councillor Dragon, as he is a Purbeck district councillor. And I will leave you with that splendid thought while I finish my pasty. 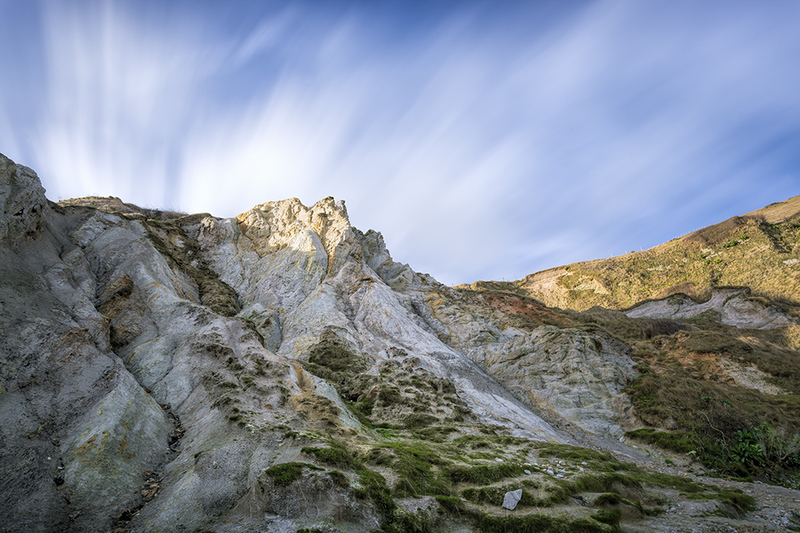 A long exposure gives the clouds a bit of movement over these interesting looking cliffs. My pasty cravings satiated, I took a drive over to Durdle Door to check up on what was happening at the old rock portal. As it turns out not a lot, because of the time of year, the sun wasn't even on the impressive arch, and wouldn't be for the what was left of the day, plus the sky above it was very bland. But thankfully it was looking a lot better over Man O'War Bay, which can be found the other side of the Door, so I scampered down the steps to the clam shell shaped beach and got a few shots. As it turned out it I didn't really get anything amazing, and I again spent an inordinate amount of time trying to get some images of the waves as they pounded against the rocks, marooned among the boisterous surf. Calling it a day, as it was clear sunset was going to be a bust, I headed back to Swanage to get some dinner and an early night, in the hope that sunset would prove to be a bit more rewarding. Clouds scud across the sky, while late afternoon sunlight hits the rock face. 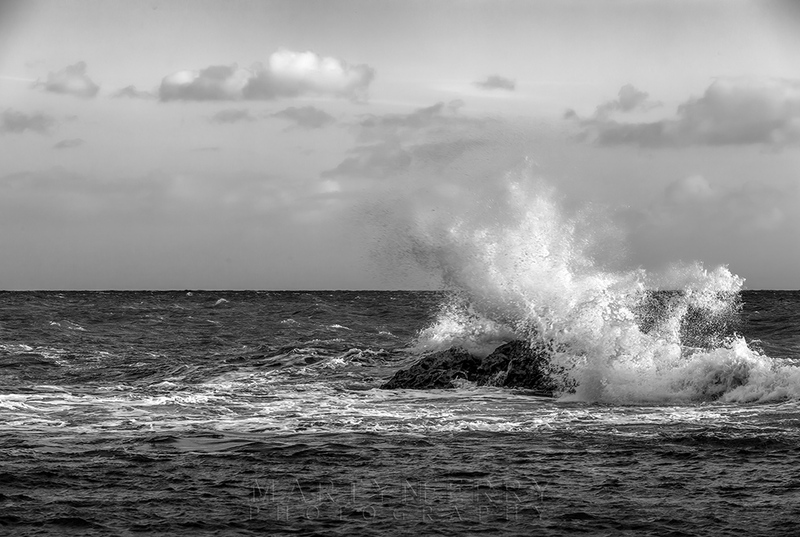 One of the many I took that afternoon of the rascally waves as they exploded into the blustery air.